Undersheriff Keith Armstrong conducts a tour. Photo by Jennifer Jean Miller. 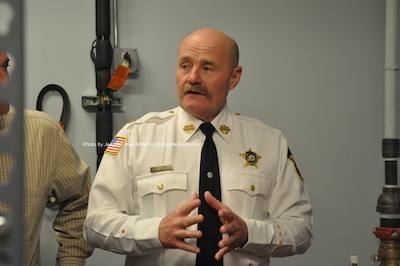 FRANKFORD TOWNSHIP, NJ – Sheriff Michael Strada and the Sussex County Sheriff’s Office unveiled the Sussex County Communications Center at the Sussex County Sheriff’s Bureau of Emergency Preparedness to an invited group on Monday, March 16. Strada and members of the Sheriff’s Office gave tours of the facility to the almost 100 attendees at the event. 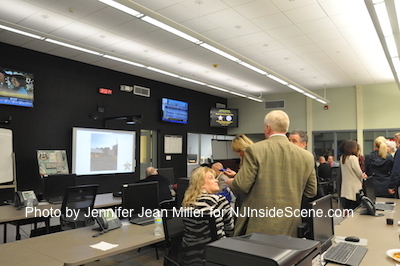 Strada told NJInsideScene.com that the communications center is currently in use for 13 municipalities in the county that are using its services for EMS and fire calls. Strada said since Jan. 2015, the communications center has taken on an average of 400 EMS calls and 200 fire calls. The facility is staffed 24 hours each day with three employees during the daytime and two on duty overnight. “We have the ability to bring in more dispatchers,” Strada added. The groundbreaking for the communications center was in Dec. 2012, when the center was acquired. It was formerly the county’s juvenile detention center and came with the price tag of $1 million. Previously, a project was conceptualized to create a new countywide center, which municipalities did not receive warmly, with an estimated cost of $7 million. Guests at the Sussex County Sheriff’s Bureau of Emergency Preparedness meet with Sheriff’s Office employees in the building’s main room. Photo by Jennifer Jean Miller. The new facility communicates with nine other county microwave towers to transfer communications. There are redundancies in the communications, in case one mode is down, said Undersheriff Keith Armstrong. Armstrong led the tours of the center, which he told visitors is also hurricane and earthquake proof. The center became a main communications source during Superstorm Sandy. In the new communications center, there are 10 workstations for the expansion of a greater workforce, in addition to the phones and computers in the main area of the building. Calls are handled in rotation between the Sheriff’s Office in Newton and the center in Frankford. One supervisor is stationed on each shift. Dave Corver of the Sussex County Sheriff’s Office explains the systems to visitors. Photo by Jennifer Jean Miller. 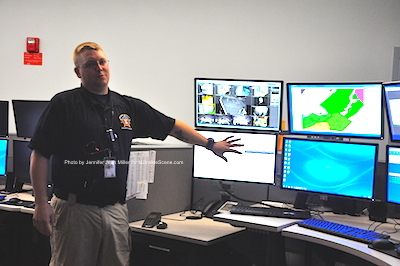 Dispatchers are equipped with stations that have map views, the ability to give instructions to callers during emergencies, and NCIC (National Crime Information Center) background checks. Additionally, a radio screen enables the center to monitor local police, fire and EMS channels, as well as sound out tones to agencies via touch screen. The climate-controlled equipment room hosts the immense servers that maintain the computers. Diesel and natural gas help to provide generator power, which kicks on in times of power outages. 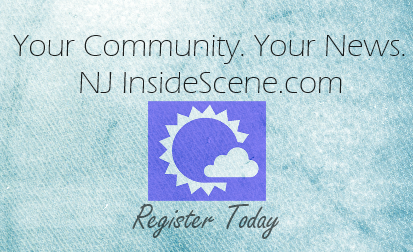 Stay on the scene with NJ Inside Scene for stories like this and click here to like us on Facebook.